The area of application for these pressure gauges with Bourdon tubes is liquid and gaseous media. For measuring tasks in aggressive, not highly viscous and non-crystallising media, even in aggressive environments, the stainless steel variants are suitable. Liquid filling of the case ensures precise readability for the pressure gauge, even with high dynamic pressure loads and vibrations. 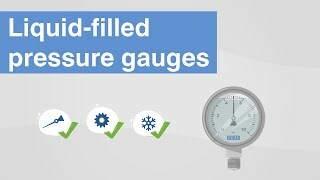 When it comes to the highest accuracy, within WIKA's broad selection you will also find precision pressure gauges measuring with accuracies of 0.1, 0.25 or 0.6 % of the full scale value. A DKD/DAkkS certificate can be generated for these pressure gauges. These pressure gauges with diaphragm pressure elements are suited to gaseous and liquid aggressive media. Pressure gauges with open connecting flanges are even suitable for highly viscous and contaminated media, in aggressive environments too. Depending on the instrument model and pressure range, an overpressure safety of 3x or 5x the full scale value is standard. This overpressure safety is also possible for 10, 40, 100 or 400 bar special designs. The measuring accuracy is maintained. With high dynamic pressure loads and vibrations, a liquid filling within the case of the pressure gauge ensures precise readability. Optional special materials are available for wetted parts. The application range for these pressure gauges is gaseous media. The scale ranges are between 0 … 2.5 mbar and 0 … 1,000 mbar in accuracy classes from 0.1 to 2.5. The construction of these pressure gauges consists of two circular-shaped, corrugated diaphragms, joined together around the rim with a pressure-tight seal. In certain cases overpressure protection is possible. The pressure gauges are used mainly within laboratory, vacuum, medical and environmental technology for filter monitoring and contents measurement. 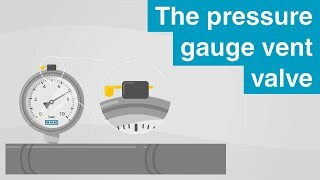 When pressures are to be measured independently of the natural fluctuations in atmospheric pressure, absolute pressure gauges are used. The pressure of the measured media is determined against a reference pressure, which corresponds to the absolute pressure zero point. So that there can be a near-perfect vacuum in the reference chamber, this is completely evacuated. The scale ranges for the pressure gauges are between 0 … 25 mbar absolute and 0 … 25 bar absolute, with accuracy classes of 0.6 ... 2.5. These highly precise pressure gauges are used, for example, for monitoring in vacuum packing machines and vacuum pumps. They are also used for the monitoring of condensation pressures in laboratories or for the determination of vapour pressure in liquids. Differential pressure gauges work with a wide range of pressure elements. As a result, measuring ranges from 0 ... 0.5 mbar up to 0 ... 1,000 bar and static overlay pressures up to 400 bar are possible. These differential pressure gauges monitor, for example, the flow of gaseous and liquid media and the degree of fouling in filtration plants. They are also used for overpressure monitoring in clean rooms and for level measurement in closed vessels. They are also suitable for the control of pumping plants.